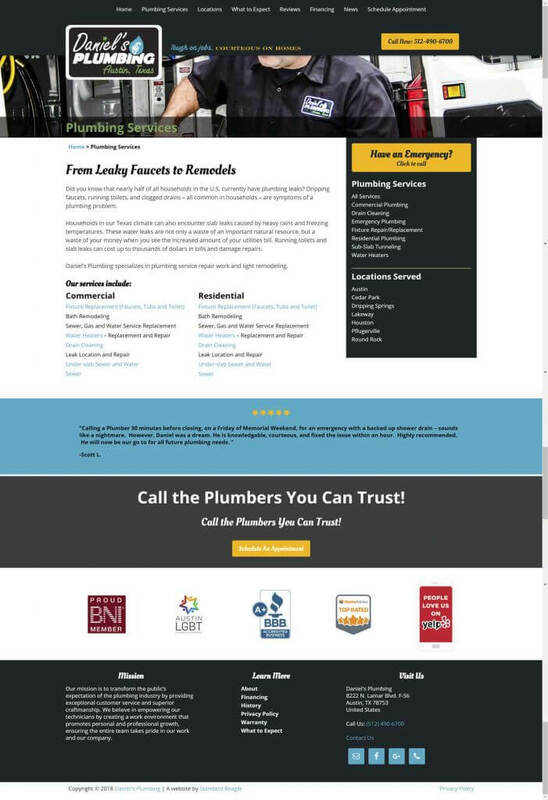 When Daniel’s Plumbing called us in late 2017, they were looking for a fresh eye to their website. 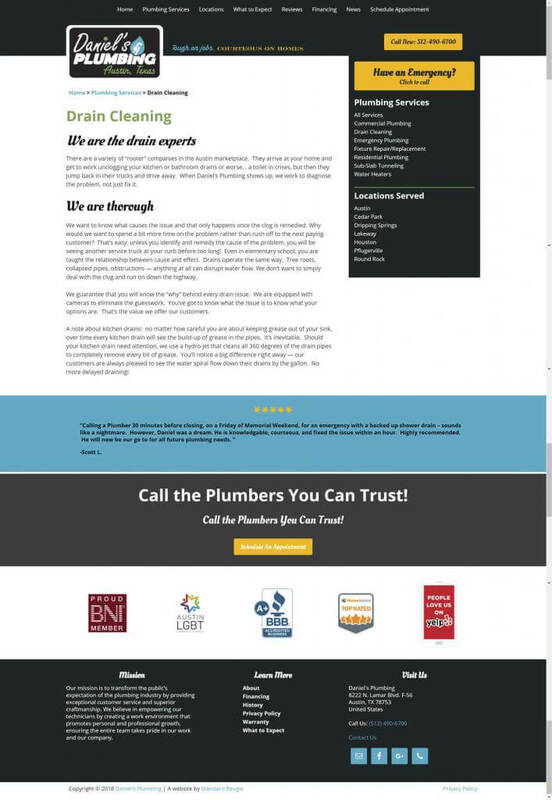 The website was an integral part of the local plumbing company’s customer engagement strategy, especially in such a competitive market as Austin. The company’s owner had a clear brand and mission for his company. What he needed was someone to help him realize both online. That’s when he called Standard Beagle. He turned to us to provide innovative solutions for drawing customers in so they would choose Daniel’s Plumbing for their plumbing needs. We started by analyzing Google Analytics. Daniel’s Plumbing had strong web traffic, but we noticed something was off. Traffic was high, but they weren’t staying. We knew we needed to make the user experience engaging and draw users in. We inventoried and reviewed all pages on the site, making suggestions for additional content. We wanted to make sure that the experience was consistent, no matter where a user entered the site, and that every page communicated the company’s brand and mission. The newly redesigned website launched in January 2017. Traffic initially fell off because ad spending also increased. But for the next 5 months, organic traffic to the website steadily increased month over month. In fact, between April and May 2017, traffic due to organic search grew 28.5% and overall users grew by 27%. The company is now considering a social and content marketing campaign to grow its customer base further outside of paid advertising.